Russian President Vladimir Putin warned Tuesday of a global "catastrophe" unless a diplomatic solution is reached over North Korea, rejecting US calls for further sanctions on Pyongyang as useless. Putin's comments appeared to draw the lines for a clash with Washington, which on Monday demanded the "strongest possible measures" against North Korea for detonating what it said was a hydrogen bomb. The announcement and North Korea's claim that it could mount the warhead on a missile, dramatically upped the stakes in Pyongyang's standoff with the international community over its banned weapons programmes. 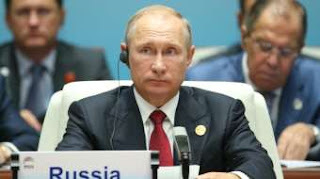 Putin, speaking after an international gathering in China, said Russia condemned North Korea's "provocative" actions. "But resorting to just any sanctions in this situation is useless and inefficient," he told reporters in the Chinese city of Xiamen following a summit of the five-nation BRICS club of emerging economies. Putin called for dialogue and warned against other actions that could escalate the crisis. World powers are scrambling to react to the latest ominous advance in the North's rogue weapons programme, which has sent global tensions soaring. US President Donald Trump has approved in principle the sale of "many billions of dollars' worth of military weapons and equipment" for South Korea, the White House said Monday. South Korea said it fired a volley of ballistic missiles on Monday to simulate an attack on the North's nuclear test site, followed Tuesday by major live-fire drills at sea. At an emergency meeting of the UN Security Council, US Ambassador Nikki Haley said Washington would soon present a new sanctions resolution for debate in the coming days. Declaring that "enough is enough," Haley said incremental sanctions imposed since 2006 had not worked and accused North Korean leader Kim Jong-Un of "begging for war" with the country's sixth and most powerful nuclear test. North Korea's underground blast had a yield of up to 100 kilotons. That would make it around five times more powerful than the bomb detonated over Hiroshima in 1945. Haley did not spell out what measures Washington was seeking, but diplomats said they could target oil supplies to North Korea -- potentially dealing a major blow to its economy. New sanctions could also seek to curb tourism to the country and ban North Korean labourers sent abroad. Russia, along with China -- North Korea's patron and closest political and economic partner -- tend to resist placing pressure on North Korea. During the Security Council meeting, China's ambassador Liu Jieyi warned that the crisis was worsening and emphasised the need for dialogue and a diplomatic solution. "China will never allow chaos and war on the (Korean) peninsula," he asserted. The Security Council has imposed seven sets of sanctions on North Korea since it first tested a nuclear device in 2006, though Pyongyang has repeatedly found ways to circumvent the measures. The most recent resolutions imposed last month, however, have zeroed in on its already stricken economy, targeting key export sectors such as coal that are a source of hard currency for the regime. The newest sanctions followed Pyongyang's firing in July of two intercontinental ballistic missiles (ICBMs) that apparently brought much of the US mainland into range. Seoul has said the North could be planning another missile test. Haley rejected the proposal as "insulting." "When a rogue regime has a nuclear weapon and an ICBM pointed at you, you do not take steps to lower your guard. No one would do that. We certainly won't," she declared. Haley reiterated US threats to impose sanctions on countries that trade with North Korea. South Korea's defence ministry said it was already strengthening its defences, in part by deploying more US-made Terminal High-Altitude Area Defence (THAAD) missile launchers. The North says it needs nuclear weapons to defend itself, and analysts say it is seeking to strengthen its hand for any future negotiations with Washington.